Team JBA USA fell from behind quickly to start the game. Although they made a comeback, the 24 point deficit was too much to overcome. The 12 game winning streak came to an end with a 129-122 loss to Rabotnicki KK on Wednesday evening at the Telecom Arena in Skopje, Macedonia. JBA USA (13-3) fell behind from the start and couldn't get a lead the entire game after trailing 41-17 at the end of the first quarter thanks to 19 three pointers as a team for Rabotnicki. JBA USA chipped away and left at halftime down 64-50 and even came back down by a point, but couldn't pull ahead. Curtis Hollis (198-G/F-98, college: Hutchinson CC) led JBA USA with 38 points and eight rebounds while Jordan Ray (191-PG-00) scored 27 points and dished out 20 assists. LiAngelo Ball (196-G-98, college: UCLA, agency: Slash Sports) scored 34 points and took charge of the team in the second half, but the spark in the attempted comeback was from Harrison Rieger, who scored 11 points to go with his six boards as he hustled and kept Rabotnicki from extending the lead. 'We were down pretty big,' Rieger said. 'We didn't get off to a good start. It kind of frustrated me on the bench because I just want to help my team in anyway. When I came in, I knew I had to be a hustle guy and do everything I can to get rebounds and points. I just wanted to help my team and comeback. We fought tooth and nail, but in the end, it just didn't work out.' Dimitar Karadzovski led Rabotnicki with 26 points while Viktor Efremovski (192-SF-98) added 24 points and Marjan Janevski (203-F-88) scored 23 points for Rabotnicki, which is the top team in Macedonia and also plays in the top division. Chavdar Kostov (195-SG-88, agency: Interperformances) scored 16 points for Rabotnicki, Bojan Krstevski scored 11 points and Kirill Nikolovski added nine points for Rabotnicki, which also won a National Championship last season, their 15th title in 25 years. Deon Lyle scored 10 points to go with six rebounds while Melvin Davis grabbed six rebounds for Team JBA USA, as they head to Sofia, Bulgaria at the Universiada Hall to take on Academic Sofia on Friday November 16. Game time is set for 8:00 am EST. The Ball family grew into a household name by doing and saying the unexpected. Unconventional move after unconventional move throughout 2017 kept basketball fans on their toes while drawing criticism from others. First it was Lonzo Ball opting to go the independent route by helping launch his family's brand instead of signing a traditional sneaker contract with Nike, adidas or Under Armour. 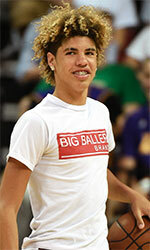 Then it was Lamelo Ball (6'5''-G-01, agency: Slash Sports) withdrawing from Chino Hills HS to be home schooled. Then it was LiAngelo Ball withdrawing from UCLA to go pro overseas. That subsequently led to Melo and Gelo signing pro contracts in Lithuania with BC Vytautas Prienai. Then this past summer LaVar Ball launched the JBA league with the premise of offering top HS players an alternative to college, offering to pay players and touring throughout the United States during the summer and now throughout Europe in the fall. And now the Ball family has made another unexpected turn. 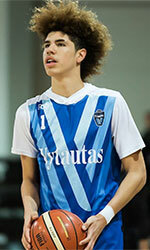 Over the last couple of weeks LaMelo sat down with his family and after multiple discussions the decision was made for the 17-year-old stud to return to high school in the United States and rejoin his peers. At the time Melo left Chino Hills HS last year he was ranked as the No. 7 recruit in the Class of 2019 and the clear-cut most famous high school hooper in the world. LaMelo will enroll at Spire Institute in Geneva, Ohio. He'll be playing for the basketball program there this winter and is expected to make his debut on November 13 against national powerhouse La Lumiere in Indiana. Because Spire Institute is a prep school instead of a traditional high school, LaMelo will be eligible to play against other top prep schools. The thinking behind this decision is to show scouts just how good LaMelo is when placed among his own age group-especially with him being eligible for the 2020 NBA Draft. In his last JBA International Tour game against the London Lions, the now 6-7 point guard posted a 41-point triple-double (17 assists and 13 rebounds). He averaged 40.0 points, 13.8 rebounds, 11.0 assists and 3.6 steals per game during the inaugural domestic JBA season last summer. During the first seven games of the JBA International Tour he averaged 29.9 points, 12. 4 assists, 8.7 rebounds, and 5.1 steals. LaMelo boarded a cross-Atlantic flight back to LA on Monday and is expected to start at Spire in the coming days. The Chino Hills native was the talk of high school hoops just a season ago, with highlights from every single one of his games being dissected on online on a nightly basis. Expect it all to return this season to a social media feed near you.